Firestone Building Products in Prescott, a part of the national footprint of Bridgestone Americas, Inc., offers opportunities for employment directly after high school graduation. 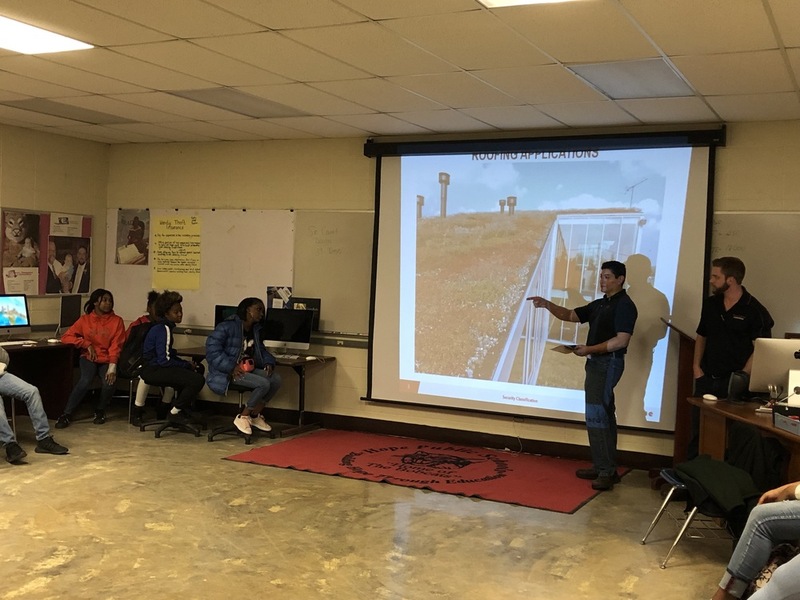 Students in the Noble Impact program at Hope High School learned recently how the Hope Public Schools Manufacturer of the Month for February creates those opportunities. Manufacturing Engineer Alejandro Barrera-Perez and Electrical Engineer Justin Litton at the Prescott building products facility gave the class an overview of the process and employment partnership at Firestone. He said employees are expected to be on time for their shift, to be at their work site throughout the required time, be willing to learn how to improve, be willing to attack and solve problems, and demonstrate a professional work record. Collaboration in problem-solving is a key trait for Firestone employees because not all problems are isolated to one aspect of the production process. Collaboration between Firestone, its customers, contractors, vendors, and engineering and marketing resources is critical, so the ability to state needs, problems, solutions and applications clearly is vital, he said. “Communication is very important,” Barrera-Perez said. Firestone Building Products operates 24-hours daily, seven days a week through four shifts daily, and employees some 654 personnel, according to PrescottArkansas.com online. The Prescott facility employs administrative, engineering, management, purchasing, maintenance and production personnel. Barrera-Perez deals with processes that create workflow for production of the product lines manufactured in Prescott; while, Litton deals with powering those processes and the resources of the facility. Both Barrera-Perez and Litton provide engineering support for the maintenance department, which they described as the “backbone” vital to production. Production personnel work to bring the product to completion through process scheduling, production and maintenance of the production equipment which are required to take raw materials and turn them into the branded roofing applications that are under the Firestone name, they explained. Those products are marketed to customers who order directly from Firestone BP mostly for commercial and industrial construction roofing applications. Both Barrera-Perez and Litton said job safety is a key priority. Working from a base entry rate of $18-plus per hour across production lines, Litton said Firestone employees can begin work in Prescott during their final year of high school if they are age 18. He said annual income is not limited because overtime work is allowed at Firestone. “There are many different routes to choose from,” Litton said. Barrera-Perez said the national reach of Firestone as a subsidiary of Bridgestone Americas, Inc., not only allows the prospect for advancement, but also for working at other company facilities. “It is where you see yourself in 20 years,” he said. Litton said that was one reason he joined the company. “As I got older, I started seeing the importance of knowing what I wanted to do,” Litton said. He said relating that to what he “liked” directed him to an internship at Cooper Tire and, then, completion of an Electrical Engineering degree at Texas A&M University in College Station, Texas. Barrera-Perez said he took a similar path after realizing in high school that he liked the versatility of Mechanical Engineering, and eventually earned a degree in the field from Texas Tech University in Lubbock, Texas.